North Somerset is located in the south west of England. The seat was created in its current form in 2010. The current member of parliament is the Conservative Party’s Liam Fox who has served since 2010 (Woodspring 1992–2010). I am 45 years old, married with two children and have lived in Nailsea for 10 years. I have a degree in Food Science and previously worked in retailing, manufacturing and consulting in the food industry before moving into IT. Most recently, I’ve been working as interim Chief Executive of ERIC, a small national children’s charity based in Bristol. Passionate about social justice and working to eliminate all forms of inequality, I’m committed to reforming our tax system to bring an end to corporate tax avoidance and I am an ardent supporter of keeping the NHS public. I fiercely oppose fracking and other activities that cause environmental damage. If elected to parliament, I will work to achieve a fair and equitable society for all, help protect the vulnerable and fight for the socially excluded of North Somerset. I will vote with my conscience and for my constituents, taking the time to consult them regularly about their views and concerns. I am immensely proud to have been chosen to stand North Somerset. Our local MP has been comfortable in his seat for far too long, and people are keen for a positive change. The Green Party wants to end the austerity politics that has undermined our valuable institutions and caused immense suffering to least well-off, whilst the super-wealthy 1% continue to increase their stranglehold on society. We need to reverse the injustices they’ve caused and protect our environment for all the species that depend on it. I will hold regular public meetings in addition to fortnightly surgeries around the constituency. I will also use social media and online referenda to consult with my constituents as widely as possible. I see my election as being principally to represent my constituents, rather than to slavishly follow a party whip. The Green Party does not operate a whipping system. The Green Party have the right policies to restore fairness and equality to our society. 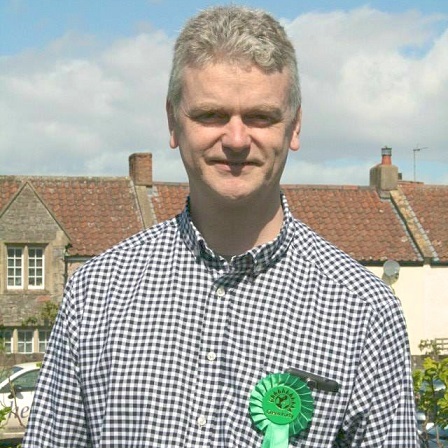 I have spent over 20 years working in various business, public sector and charity organisations, and I believe my track record and experience will serve me well to represent the constituents of North Somerset, whatever their own background. 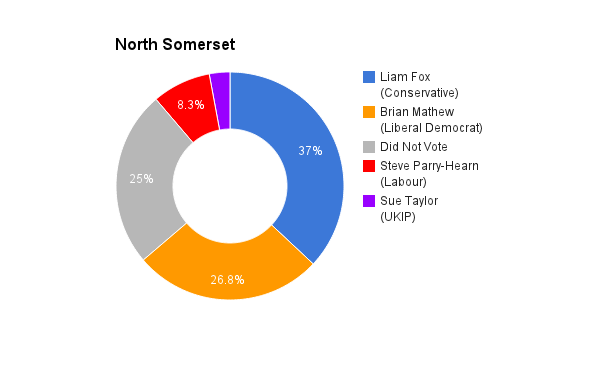 Liam Fox has the reputation of generally having been a supportive and attentive constituency MP, with a regular presence in the constituency throughout much of his time representing North Somerset. I would want to continue this approach. Although our core political beliefs are very different, I see no reason why the level of support and involvement I provide to my constituents as their MP should alter. Primarily, I am seeking election to serve and represent them. Austerity is failing the people of the UK. Those least able to support themselves (the sick, those living with disabilities, older people, those in work but poorly paid, and other socially excluded groups) are suffering while the most prosperous in our society are able to get away with avoiding tax, exploiting workers, and having it all without giving very much back. The coalition have failed to eliminate the deficit and almost doubled the national debt. Shady deals like PFI and the creeping privatisation of our key services are undermining our society and sucking critical funding away from those services for a quick profit. Without migrant workers vital public services like the NHS would not be able to function. Most migrants are contributing more to British society than they take out, and diversity and multiculturism works well on the whole. Where there are problems we must take steps to work together, not scapegoat and blame those coming here to improve their lives. Where increased demands are placed on our public services, we should be developing our infrastructure to support the population, rather than cutting back investment in schools, roads, and other critical services. Wages are now starting to rise, and we are facing a risk of deflation, but there has also been rapid growth of very one-sided zero hours contracts, which favour the employer and mean that many workers’ weekly income is very unpredictable. This results in many having to resort to benefits and food banks despite being “in work”. We need to increase the minimum wage to a living wage in order to stop the state having to subsidise private employers. The Green Party would increase the main minimum wage to £10 an hour by 2020. I would like to be part of a government that repeals the 2012 Health and Social Care Act, replacing it with an NHS Reinstatement Bill, reversing privatisation and making the Secretary of State for Health accountable once more for providing a service to the entire population. The NHS must be free at the point of use, publicly provided and publicly funded. Although unemployment is not a significant problem in North Somerset, those that aren’t working desperately need opportunities to do so. The Green Party will create jobs by increasing funding for the NHS and Social Care, and by developing the renewable energy sector. Yes I believe that it does. There were more men in the the last parliament than there have ever been women represented in parliament. We should be working towards making the job of representing constituents more attractive and appealing to women and to minority groups, as well as attracting people from all parts of society. The presence of too many white men with privileged backgrounds (a group I consider myself to be a part of), many of whom have never worked in any other profession is fundamentally wrong, and fails to represent our society as a whole. I firmly believe that the UK should be a member of the EU, so I would encourage my constituents to vote in favour of retaining our membership. Despite its many flaws, the EU is a force for good in our society. It benefits us far more than it costs us. There is a need for fundamental reform, but we cannot work to achieve that by being outside it.